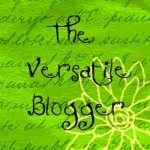 My sweet, sweet friend Dacia awarded me with the Versatile Blogger Award. When I saw that I had received this I was so excited! I mean, I’ve been blogging for a while now, but only here at WordPress for a short time. Dacia’s is one of the first blogs I subscribed to. Her blog is very inspiring to me. If you haven’t subscribed to her blog yet you really should! In accepting the award I have to do two things: share 7 things about myself and pass on the award to other wonderful bloggers. 5. The first time I moved I was 24 years old. Since then I’ve moved 11 times.